Studying at Marwadi University will make you an expert in academics. But, there are other valuable qualities that will be developed while you’re studying here. Organizational skills play an important role in a committee and society. Students at Marwadi University have opportunities to participate in numerous events and fixtures. It is a great way to learn how to fulfill commitments and coordinate according to priorities. Ability to organize self and others gives you an upper hand in the private/public sector. Better management of time enables you to fulfill tasks on or before timeline. Managing your time efficiently helps you to deliver a better quality of work. Being on top of your allotted time at work will provide you with more opportunities. 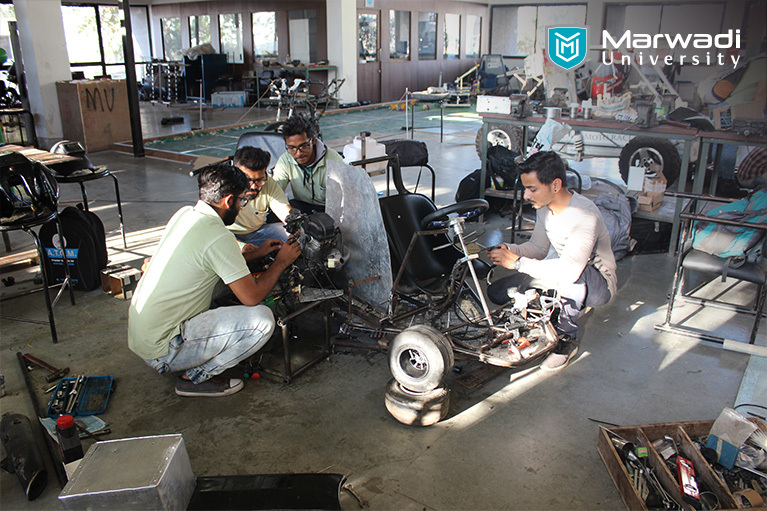 We, at Marwadi University, arrange extracurricular activities for students that will help them build their abilities to the fullest. They also get acquainted with how to manage these activities along with studies. Research centers at Marwadi University provide you with ample opportunities to discover something unique about your subject. Research study fosters creativity in students because it contributes to knowledge from worldwide. Furthermore, students get aware of analysis and evaluation process. Communication is a fundamental requirement of every human being to survive in the world and organizations. It is a common understanding of how people reach out for one another. Furthermore, it is considered as a process to create and share ideas. We, at Marwadi University, organize debates, where students speak up and communicate their ideas. Participating in a leadership meeting during events also contributes to this skill. Problem-solving skills are required at every step of life. It includes phases like research, analysis, decision-making, communications and dependability. We, at Marwadi University, use real-life problems in teachings that would give them better perspective. They get a better understanding of how to approach for a solution. Marwadi University reflects values that will help our students to lead a purposeful and respected life. We motivate them to think out of the box. To get more information on how Marwadi University prepares its students through education and curricular activities, visit our website.